Kennedy family dog Clipper stands on the West Wing Lawn, June 3, 1963. 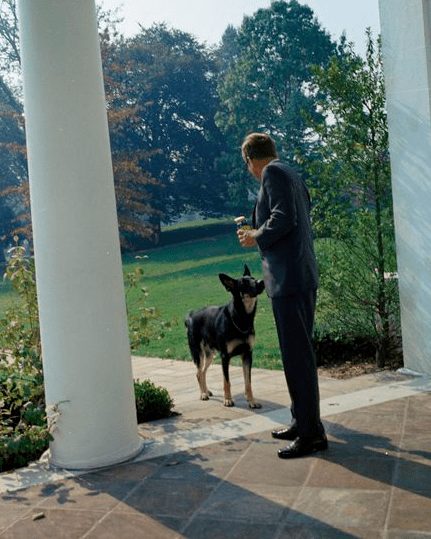 If Shannon was JFK’s favorite dog in the White House, Clipper was First Lady Jackie Kennedy’s favorite. A gift from her father-in-law, Joseph P. Kennedy, who was the former U.S. Ambassador to Great Britain, Clipper frequently kept close by Jackie Kennedy’s side. An article in the Jan. 27, 1963 edition of The Pittsburgh Press reveals that the First Lady tried to walk Clipper, a German shepherd, outside the White House on at least one occasion. President Kennedy feeds Clipper at the West Wing, Oct. 24, 1963, less than one month before JFK was assasinated. Writing about himself in the third person, Smith reports that he snapped his fingers and made a clucking sound to get the attention of the woman’s young police dog, whereupon “suddenly another man came seemingly from nowhere, positioning himself quickly between the two strollers until the woman was well beyond the fellow who had greeted the pup. The training certainly changed Clipper. “It seemed to help quite a bit,” said Bryant. Have you any information that could shed som light on what happened to the many dogs of the Kennedys, after his assassination in 1963, please? I’ve seen numerous photos of Clipper but instead of a German Shepherd, could Clipper have been a Beauceron (the so-called French Shepherd)? 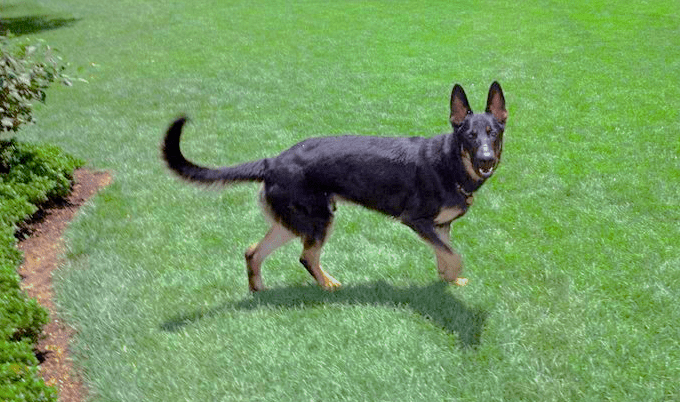 Clipper’s eyes, build and coloring look much more like a Beauceron which would have been so appropriate for Mrs. Kennedy. Clipper looks like a European bred working line German Shepherd dog to me. This is what the breed was originally intended to look like.